As regards the other Mantras those wishing to meditate on Shiva can if they wish add Om before the single letter Mantra . can these be practiced alone and can you please say what basically are the benefits of each one. Any of these Mantras can be practiced alone, all lead to Shiva. What if i chant "Aum bam jum Haum" together? Would there be any side effects or would it become less futile? No, you should select one of the Mantras for chanting. Sir. 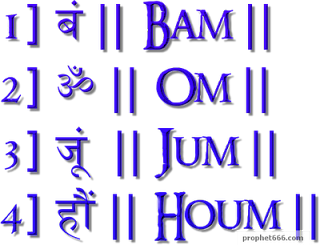 Please check if the last beej mantra should be "hraum" or "haum"? I found many references writing it up as "hraum", your check and approval is requested. Please act upon it. Sir, could I use this like "om haum namah shivaay"? Wouldn't it enhance the mantra? Also, please publish some shabar mantras of shiv. Both for daily prayer and sadhna. Please publish some shiv mantras which are easy to use but extremely effective and provocative. No, you as I have pointed in the above comments, it is better to select one of the Beej Mantras and concentrate your energies upon that Mantra.